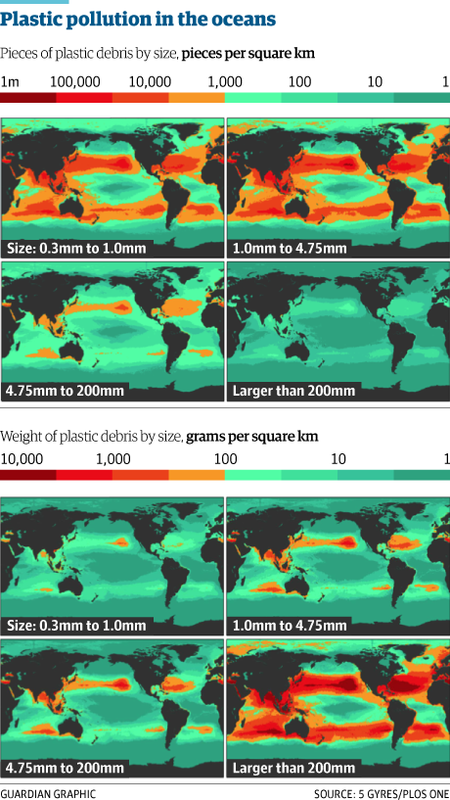 The volume of plastic pieces, largely deriving from products such as food and drink packaging and clothing, was calculated from data taken from 24 expeditions over a six-year period to 2013. The research, published in the journal PLOS One, is the first study to look at plastics of all sizes in the world’s oceans. This Documentary includes interview from Capt. Moore (Algalita Marine Research Institute), Anna Cummins (5 gyres Institute), Dr Andrea Neal (Jean-Michel Cousteau), Surfrider Foundation and a variety of Scientist and Doctors who have been researching how bad the situation is. It will give you a real idea of how much damage we are creating and how fast we have to stop in order to survive the future. “We saw turtles that ate plastic bags and fish that ingested fishing lines,” said Julia Reisser, a researcher based at the University of Western Australia. “But there are also chemical impacts. When plastic gets into the water it acts like a magnet for oily pollutants. The researchers collected small plastic fragments in nets, while larger pieces were observed from boats. 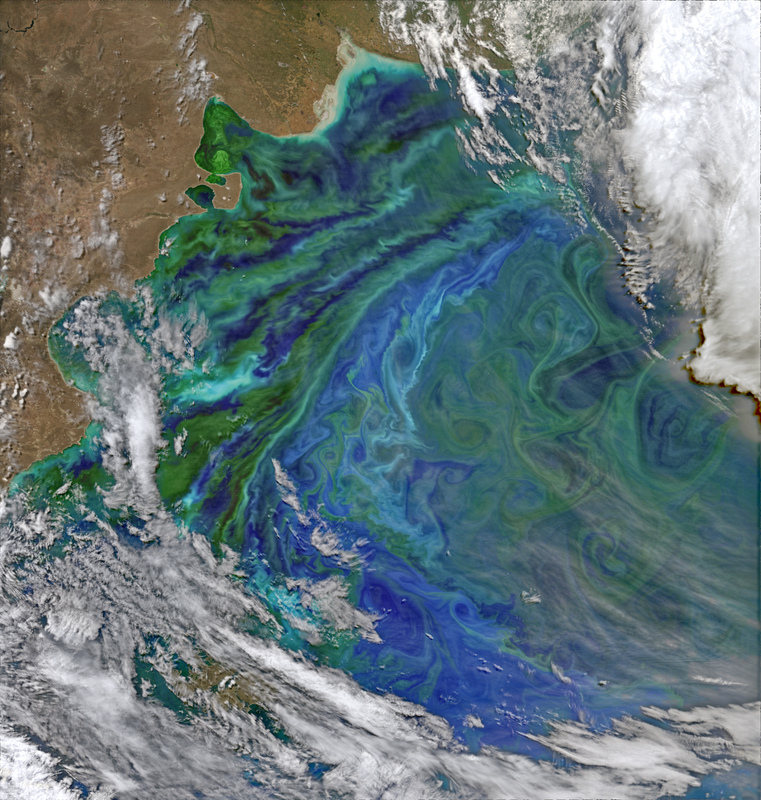 The northern and southern sections of the Pacific and Atlantic oceans were surveyed, as well as the Indian ocean, the coast of Australia and the Bay of Bengal. While spread out around the globe, much of this rubbish accumulates in five large ocean gyres, which are circular currents that churn up plastics in a set area. Each of the major oceans have plastic-filled gyres, including the well-known ‘great Pacific garbage patch’ that covers an area roughly equivalent to Texas. “Our findings show that the garbage patches in the middle of the five subtropical gyres are not the final resting places for the world’s floating plastic trash,” said Marcus Eriksen, another of the report’s co-authors. “Lots of things are used once and then not recycled,” Reisser said. “We need to improve our use of plastic and also monitor plastics in the oceans so we get a better understanding of the issue. The morning of February 22, 1901, was much like any other on San Francisco Bay. A thick blanket of fog spread across the water as the steamer City of Rio de Janeiro approached the Golden Gate, laden with passengers and freight from Hong Kong, Yokohama and Honolulu. Returning to San Francisco after more than two months at sea, the City of Rio’s cabins brimmed with the hopes and dreams of Chinese and Japanese immigrants seeking a new life in the United States. Up on deck, Captain William Ward and Pilot Frederick Jordan steered what they thought to be a safe course into the narrow mouth of the Bay, but could make out no landmarks through the damp gray void. Present day photo at the entrance of the Golden Gate looking westward with Fort Point at the far left where the SS City of Rio de Janeiro struck the rocks and foundered on February 22, 1901. Shortly after 5 a.m., with visibility still at zero, disaster struck. The 345-foot steamer had veered too far south on its approach and suddenly ground to a halt on the jagged rocks of Fort Point, tearing a massive gash in its iron hull. A strong ebb tide soon pushed it back off of the rocks and allowed the frigid winter waters of the Pacific to rush into the engine room and cargo holds. Passengers and crew fought their way to the deck, but confusion reigned on the rapidly sinking ship. Within a matter of minutes, the City of Rio succumbed to its wounds and slipped beneath the waves, taking with it 128 of the 210 lives on board. City of Rio de Janeiro,City of Chester and Fernstream. 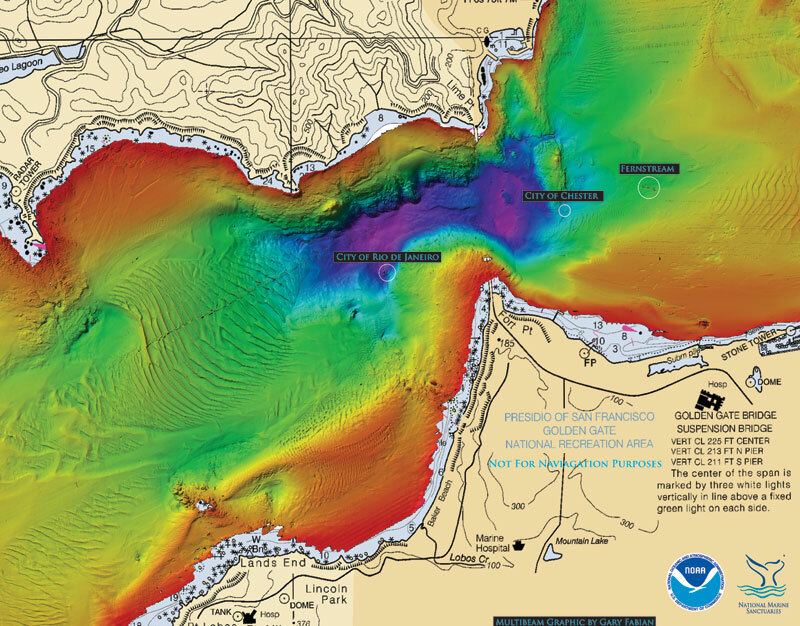 This November, a joint archaeological expedition led by the Office of National Marine Sanctuaries Maritime Heritage Program set out to document the wreck as part of a two-year study of shipwrecks in Gulf of the Farallones National Marine Sanctuary and the surrounding area. Bay Marine Services LLC provided a vessel and crew for the mission, while Hibbard Inshore LLC andCoda Octopus equipped the research team with a high-powered remotely operated vehicle (ROV) and 3-D sonar array to aid in the search. West Coast Regional Maritime Heritage Coordinator Robert Schwemmer worked in cooperation with Maritime Heritage Program Director James Delgado and sonar expert Gary Fabian to pinpoint the location of the City of Rio, which lies 287 feet below the surface just outside the Golden Gate, not far from where it ran aground in 1901. CodaOctopus 3-D Echoscope sonar images of the SS City of Rio De Janeiro. The 3-D model generated by the Coda Octopus “Echoscope” sonar also gave researchers an entirely new perspective on the condition of the wreck site. What they found was a crumpled, scarcely recognizable iron hulk encased in more than a century worth of mud and sediment, lending support to the narrative that the ship sank quickly before many of its passengers could escape. The expedition team also remapped the S.S. City of Chester,a second nearby wreck that was rediscovered in May 2013 by NOAA’s Office of the Coast Survey. In stark contrast to the City of Rio, the Echoscope revealed in great detail the surprising level of preservation of the City of Chester’s frame and propulsion machinery, telling a very different story about the circumstances of its sinking. 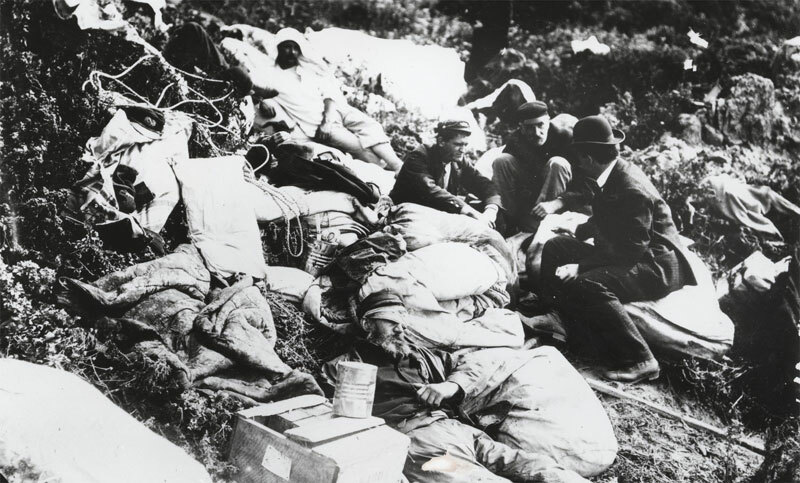 Survivors from SS City of Rio de Janeiro after the sinking at Baker's Beach. Through advanced technology and innovative partnerships, NOAA is breaking new ground in our quest to explore and understand our nation’s maritime heritage. Shipwrecks once believed to be lost forever are now within our reach, and those we have studied in detail continue to give up new secrets with each subsequent expedition. This discovery is a reminder of NOAA’s commitment to protecting the profound ties that the nation has to our history lying beneath the ocean’s surface. Since the Treaty of Westphalia in 1648, the concept of open seas for trade has been considered a cornerstone of the international order. But despite the recognition of the importance of open trade, the seas remained an anarchic place for hundreds of years. In 1982, the United Nations passed the Convention on the Law of the Sea. This law marked the first successful international agreement for collaborative maritime security. During this time, maritime law shifted from focusing on the prevention of naval warfare — which is an incredibly rare occurrence in the present day — to ensuring the security and safety of the oceans for all to use for trade. This focus on security, and the doctrine of the Freedom of the Seas, allowed maritime trade to prosper. Today, 90% of all trade is conducted via the sea. However, maritime trade continues to remain threatened by a global resurgence in piracy and illicit trade on the high seas. Norwich University has released the following infographic documenting the rise of the law of the sea and international maritime trade, charting four centuries of one of the most important concepts in international peace and security. Law of the sea mechanisms, specifically the 1982 United Nations Convention on the Law of the Sea (UNCLOS), provide an engaging starting point for regulatory analysis of private maritime security. Although it is not the only relevant legal instrument in existence, the Convention is the most pertinent, setting the backdrop for oceans management and providing the broadest foundation for uniform governance. UNCLOS is often regarded as a framework convention: It sets up institutions and balances the rights and obligations of states with the interests of the international community. It is supplemented by other conventions and protocols. Yet UNCLOS does much more than simply set up broad frameworks. It also specifies detailed nautical-mile limits for maritime zones and establishes “rules of the road” for oceans management and operations at sea. UNCLOS also contains a brief, but specific, security component that addresses key tenets of responding to maritime threats. In today’s international security paradigm, the applicability of the UNCLOS framework with regard to maritime security is often called into question. Because traditional state-on-state warfare is being replaced by two opposing groups of non-state actors, embodying threats to both maritime security and the protectors of international shipping commerce. UNCLOS provides two specific regimes which are fundamental to maritime security and order on the seas: the regime of consecutive maritime zones, and the jurisdictional trinity of flag, coastal and port state control. In fact, UNCLOS is the only international convention which stipulates a framework for state jurisdiction in maritime spaces. 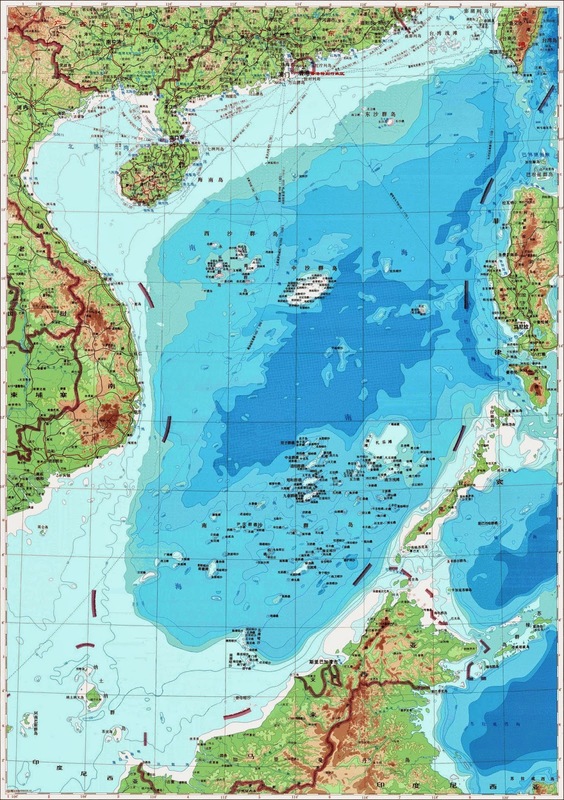 UNCLOS sections the oceans, splitting marine areas into five main zones, each with a different legal status: Internal Waters, Territorial Sea, Contiguous Zone, Exclusive Economic Zone (EEZ) and the High Seas. It provides the backbone for offshore governance by coastal states and those navigating the oceans. It not only zones coastal states’ offshore areas but provides specific guidance for states’ rights and responsibilities in the five concentric zones. Internal Waters include littoral areas such as ports, rivers, inlets and other marine spaces landward of the baseline (low-water line) where the port state has jurisdiction to enforce domestic regulations. Enforcement measures can be taken for violations of static standards while in port as well as for violations that occurred within the coastal state’s maritime zones and beyond. However, foreign vessels are not usually held to non-maritime or security port state laws so long as the activities conducted are not detrimental to the peace and security of the locale. In the maritime security context, however, a coastal state can prevent privately contracted armed security personnel (PCASP) from entering its ports and internal waters if carriage of weapons is forbidden in national legislation. Moreover, once entering a port PCASP (and the vessel which they are aboard) can be held accountable for other violations that took place at sea if (a) they in some way impacted the port state or (b) for other reasons with the permission of the flag state. In the Territorial Sea, a coastal state has unlimited jurisdiction over all (including foreign) activities unless restrictions are imposed by law. 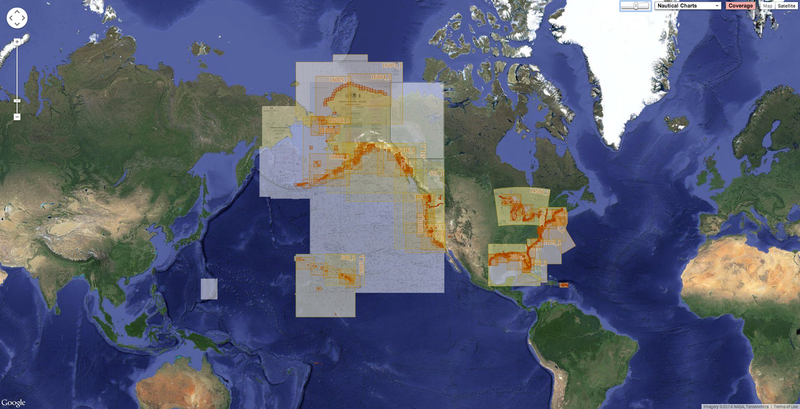 All coastal states have the right to a territorial sea extending 12 nautical miles from the baseline. 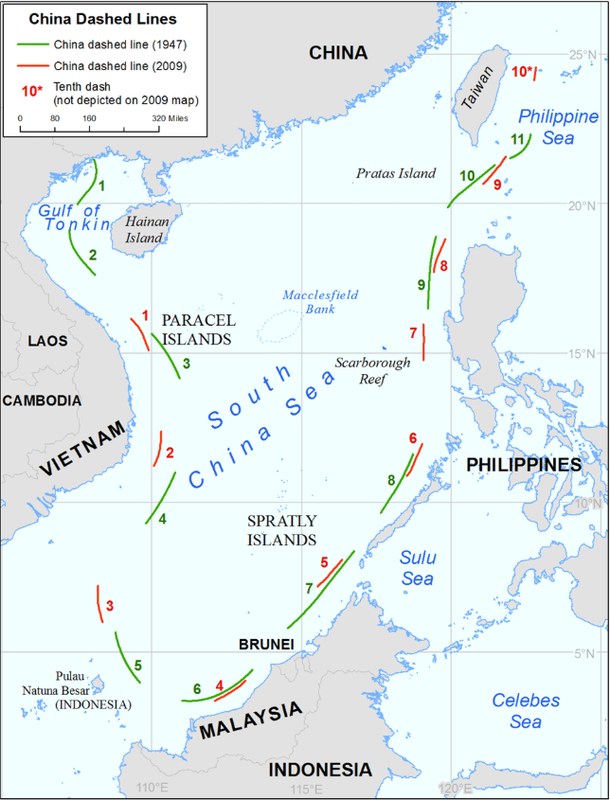 In the maritime security context, it remains debated as to whether the coastal state can set and enforce laws to restrict movement of PCASP, forbid maritime security operations (including making illegal the carriage or discharge of weapons) within the territorial sea, or if enacting such legislation would be prejudicial to general freedom of navigation and the regime of innocent passage. The Contiguous Zone is an intermediary zone between the territorial sea and the high seas extending enforcement jurisdiction of the coastal state to a maximum of 24 nautical miles from baselines for the purposes of preventing or punishing violations of customs, fiscal, immigration or sanitary (and thus residual national security) legislation. In the maritime security context, this can certainly include monitoring any activities which can result in armed violence or weapons import into the state. Therefore the coastal state can take measures to prevent or regulate armed maritime security activities out to 24 nautical miles under the reasoning that it is undertaking customs enforcement operations to prevent movement of arms into its waters/ports. The EEZ is another intermediary zone, lying between the territorial sea (12 nautical miles) and the high seas to the maximum extent of 200 nautical miles. 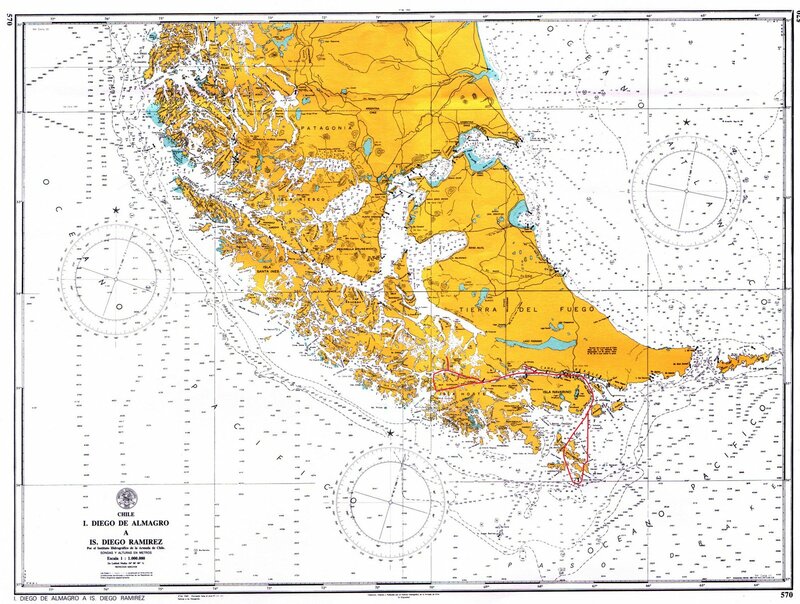 Although high seas freedoms concerning general navigation principles remain in place, in this zone the coastal state retains exclusive sovereignty over exploring, exploiting and conserving all natural resources. The coastal state therefore can take action to prevent infringement by third parties of its economic assets in this area including, inter alia, fishing, bio-prospecting and wind-farming. In order to safeguard these rights, the coastal state may take necessary measures including boarding, inspection, arrest and judicial proceedings, as may be necessary to ensure compliance with the international laws and regulations. The High Seas, which lie beyond 200 nautical miles from shore, are to be open and freely available to everyone, governed by the principle of equal rights for all. In agreeing to UNCLOS, all state parties acknowledged that the oceans are for peaceful purposes as the Convention’s aim was to maintain peace, justice and progress for all people of the world. On the High Seas, no state can act or interfere with justified and equal interests of other states. The Convention establishes freedom of activity in six spheres: Navigation, Overflight, Laying of cables and pipelines, Artificial islands and installations, Fishing, Marine scientific research. Freedom of navigation is of utmost importance for all, and maritime security activities can be considered part of navigational activities as they protect vessels from interference by third parties. Understanding the geographic location of attacks on maritime assets not only assists in developing appropriate maritime security strategies for PCASP and ensure compliance but also assists legal scholars in assessing the congruence of international legal frameworks governing threat response measures. As evidenced in the above chart from UNOSAT’s Global Report on Maritime Piracy, pirate attacks in the Indian Ocean region are most frequent on the High Seas, beyond coastal state jurisdiction. Because UNCLOS classifies piracy as offenses committed specifically on the High Seas, this leaves open a huge gap — piracy-like threats in maritime zones within a coastal state’s jurisdiction. In order to rectify this missing designation, the IMO’s Maritime Security Committee has introduced a separate term, “armed robbery against ships,” to address such crimes occurring within a coastal state’s jurisdiction (i.e., territorial and internal waters). Coastal states are encouraged to include this definition and designate such action as a crime in their domestic legislation. Thus the combined wording, “piracy and armed robbery against ships,” has become a catch-all phrase for piratical acts conducted anywhere in the world, increasing the legal latitude countries have to pursue remedies for maritime security threats and transgressions wherever they may take place. The US State Department said China failed to clarify its controversial 9-dash line claim over the South China Sea in a way consistent with international law. The Department’s Bureau of Oceans and International Environmental and Scientific Affairs published a study on Friday, December 5, assessing the consistency of China’s maritime claims with international law. The study was released ahead of a December 15 deadline for China to respond to the Philippines’ historic arbitration case on the disputed sea before an international tribunal. The US study also came just two days before China released its own position paper detailing its objection to the case. In the 26-page paper, the US said that China’s position on its maritime claims is unclear. “Unless China clarifies that the dashed-line claim reflects only a claim to islands within that line and any maritime zones that are generated from those land features in accordance with the international law of the sea, as reflected in the LOS Convention, its dashed-line claim does not accord with the international law of the sea,” the paper concluded. The US was referring to the 1982 United Nations Convention on the Law of the Sea (UNCLOS), which the Philippines cited in its arbitration case to invalidate the 9-dash line. Manila is a key treaty ally of Washington. 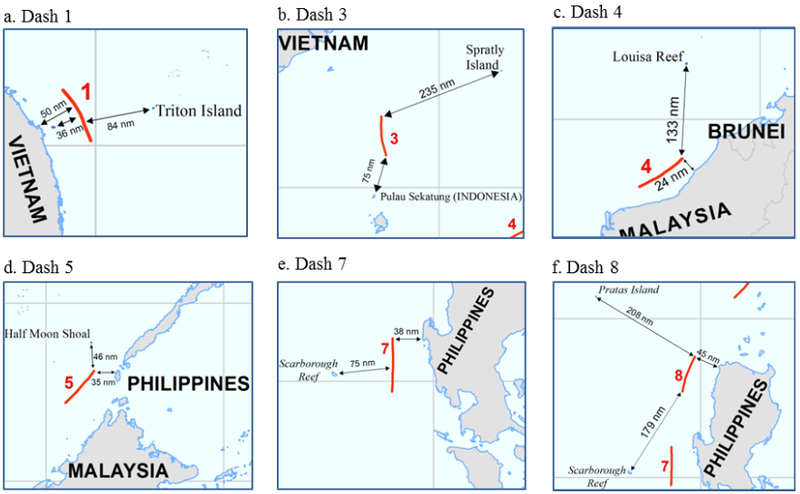 As shown on Map 4 to this study, the dashes are generally closer to the surrounding coasts of neighboring States than they are to the closest islands within the South China Sea. In other words, the distances between the dashes and the islands are generally farther than the aforementioned distances to the surrounding coasts. At their closest points, the dashes are 84 nm from the nearest island within the Paracel Islands (dash 1 to Triton Island), more than 46 nm from the nearest island within the Spratly Islands (dash 5 to Half Moon Shoal), and nearly 75 nm from Scarborough Reef (dash 7). Some of the dashes are far from the nearest islands within the South China Sea. For instance, dash 3 is 235 nm from the nearest such island, which is Spratly Island. Dash 4 is 133 nm from Louisa Reef. Dash 8 is 179 nm from the closest island on Scarborough Reef. Yet the timing of the publication was close to the deadline for China’s counter-pleading. The paper reiterated earlier statements of State Department officials asking China to clarify the 9-dash line. Chinese Foreign Ministry Spokesman Hong Lei criticized the US study on Tuesday, December 9. "The US report ignores the basic facts and international legal principles and is contrary to its promises not to take a position or sides. It is not helpful to the resolution of the South China Sea issue and the peace and stability of the South China Sea. We urge the US side to abide by its promises, act and speak cautiously and objectively and fairly view and deal with the relevant issue," Reuters quoted him as saying. China criticizes what it views as US meddling in its disputes with its neighbors. 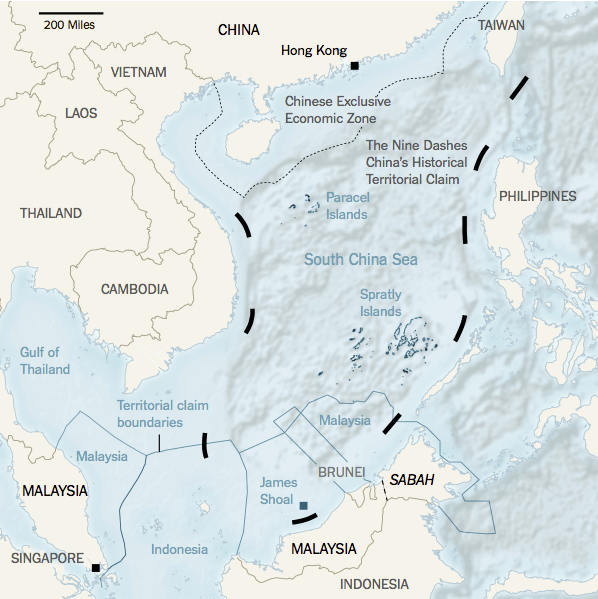 Vietnam, Malaysia, Brunei and Taiwan also claim parts of the South China Sea, believed to hold vast deposits of oil and gas, and a major shipping route. Declaring the line inconsistent with UNCLOS is the main claim of the Philippines in its arbitration case. In this June 27, 2014 photo, a printing worker holds a new officially approved map of China that includes the islands and maritime area that Beijing claims in the South China Sea, at a factory in Changsha in south China’s Hunan province. The US study analyzed the 9-dash line using 3 interpretations: as a claim to islands, as a national boundary, and as a historic claim. It is only the first interpretation where the US said the line could be consistent with UNCLOS. No acquiescence by foreign states in China’s exercise of authority in the South China Sea. “The law of the sea does not permit [maritime] entitlements to be overridden by another state’s maritime claims that are based on ‘history,’ To the contrary, a major purpose and accomplishment of the Convention is to bring clarity and uniformity to the maritime zones to which coastal States are entitled,” the paper stated. On the second interpretation of the line as a national boundary, the State Department said that this too is inconsistent with international law. “Moreover, dashes 2, 3 and 8 that appear on China’s 2009 map are not only relatively close to the mainland shores of other states, but all or part of them are also beyond 200 nautical miles from any Chinese-claimed land feature,” it said. While China released a position paper on the arbitration case, it was silent on the merits of the Philippines’ claim questioning the 9-dash line. Instead, it chose to focus on jurisdiction or technical issues on the admissibility of the Philippines’ claims. Although the US is not a party to the dispute and the arbitration case, scholars said its paper contributed to discussion on the issue. “It is a must-read for anyone interested in maritime security, the law of the sea, or China’s foreign policy,” said The Intrepeter, a blog of the Australia-based think tank Lowy Institute for International Policy. China’s position paper is also sparking debate. American international law professor Julian Ku urged the Philippines to respond by releasing its pleading or memorial. “As a legal document, [China’s] position paper is very well done and is the best legal analysis of the jurisdictional issues in the Philippines arbitration I have seen coming out of China, and certainly from the Chinese government,” he said on the legal blog Opinio Juris. “I’m sure the Philippines will be tempted to release at least the jurisdictional portion of their brief as well. I hope they do, since the public reaction to their legal arguments will be just as important as any ruling the tribunal makes,” Ku added. At the south end of Assateague Island, on a storm-shaped hook called Tom’s Cove, Ishmael Ennis likes to pace the beach. Autumn Sundays are the best time of year, he said, when the dawn chill clears out the crowds. In those solitary moments, the sands seem vast enough to drown any human concerns. “No, that’s getting too romantic,” he said, suddenly self-conscious. Ennis, 59, grew up near a crabbing town on the Chesapeake Bay. He’s tall, hay-haired, and speaks with a waterman’s drawl. “I don’t feel nothing too special,” he said. Assateague, a 37-mile-long smear off the shores of Maryland and Virginia, is the East Coast’s climate change canary. It’s one of the most vulnerable islands in America, almost certain to be one of the first places claimed by the rising sea. As 190 nations began talks on climate change Monday in Peru, barrier islands like Assateague offer a preview of issues countless coastal communities will soon face. Ennis has worked here for over 34 years, first as a maintenance worker, then as a foreman, now as the chief of maintenance for the National Park Service. In the first half of his career, he fought against nature to save this beach at Tom’s Cove. In the second half of his career, he’s been learning — and teaching others — how to let go. Barrier islands scroll up and down the Eastern Seaboard, remnants from the Ice Age. They are attractive vacation spots, and several of them have been heavily built upon, like the Jersey Shore or Miami Beach. Much of the construction happened before people fully understood that these places are particularly volatile. The clues had been accumulating for decades: Beachfronts were thinning. Storms regularly kicked down dunes and sent sand flowing to the far side. Geologists realized that the very nature of barrier islands is to roll over, typically toward the mainland, as waves and weather erode one side and build up the other. Climate change adds fresh danger. Sea levels are rising faster, and there will be more violent, seashore-scouring storms. In the least aggressive scenario, scientists believe that these effects will accelerate the natural turnover of these islands. In the more aggressive scenarios, climate change will happen too quickly for the islands to keep up. They will either break up or drown. Assateague is one of the first places in the National Park system to tackle its destiny head-on, forming a master plan for all the contingencies that climate change might bring. The process sets an example for shorelines all along the East Coast, where communities are accelerating toward similar decision: hold fast, or beat a retreat? In many locales, retreat remains heresy. Politicians vow to keep the bay at bay, or worse: vote to bury forecasts of the rising tides. But on Assateague, there will be no heroic engineering efforts, no last stands against the sea. For decades, Ennis and his team have been tinkering with the infrastructure here, making it resilient and adaptable long before those words ever passed into the climate change lexicon. Ennis’s work has helped nudge planners toward a rather Zen proposal. For the first time, humans would try to adapt to the island, instead of adapting the island to their own needs. Places like Assateague are a constantly shifting compromise between the sand and the sea. Gentle waves nourish the beach; stiffer waves scour it. The angle between the waves and the beach matters as well. Waves rarely hit an island dead-on. They approach obliquely, and the net effect on Assateague is that the sand is shunted southward. The other way that the ocean shapes a barrier island occurs during a storm, when the waves wash over, carrying sediment across the island. The storms sometimes also cut inlets, which usher through great quantities of sand. These processes add bulk to the landward side, making the island wider. In this fashion, the island rolls slowly landward, a couple of feet or more a year. The problem arises when people start building on these formations. Eventually, the island will migrate out from underneath them. Climate change will only accelerate the process. So to protect their homes and their investments against the ocean, many barrier island communities rely on feats of engineering. They strengthen dunes to bulwark against the sea. They build jetties to trap sand from moving down the coast, or even erect sea walls to blunt the scouring action of the waves. On densely packed islands, where people’s homes are at stake, these measures can seem like no-brainers despite the exorbitant price tags and damage to the environment. On Assateague, which is uninhabited and owned by the government, the debate is slightly different. What’s at stake are recreational facilities, and the ability for people to access and enjoy the island — its famous feral horses, the ghost forests of drowned loblolly pines. Nearby towns rely on the Assateague for the 2 million tourists it brings in each year. Citizens lobby for more infrastructure on the island, more amenities to attract visitors. Every national park has a guiding document that lays out a general course of action for the next few decades. Assateague’s old management plan dates from 1982. It bears little mention of climate change, nor does it seem to respect that barrier islands are naturally dynamic. At that point, the Park Service was certainly aware of the science. There were other warnings. “We are actually transplanting out cities onto barrier islands from mainland areas with the idea that these areas are just as stable as any other landforms,” one report from a 1980 Park Service conference read. Ennis started his first summer as a seasonal worker that same year. He recalls being told that Assateague’s phalanx of artificial dunes were interfering with the island’s evolution. “It was brought up that it was very unnatural,” he said. But there is theory, and there is putting theory into practice. Ennis filed the thought in the back of his head, and returned to picking up trash. Ennis spent the first half of his career maintaining the artificial dune at Tom’s Cove, where he worked as a maintenance foreman. The dune stopped most waves from spilling across the island, protecting the visitor’s center and bathrooms from getting flooded. But stopping the overwash also starved the landward side of sediment. And, as the beach in front of the dune continued to erode, this section of the island grew thinner. The fortified dune did not offer complete protection either. Waves from a determined northeaster or hurricane could punch through, and the storms whipped up other kinds of damage. Ennis’s job was to patch up the buildings in the aftermath. Sometimes, this also meant rebuilding the facilities farther and farther back from the narrowing beach. The visitor’s center, for instance, has retreated three times to escape the encroaching sea. “Let’s face it, down there the area is very dynamic, and things were changing pretty rapidly,” Ennis said. By the mid ’90s, Ennis was growing weary of these efforts. So were his crew members. “They saw just how ridiculous it was to maintain a dune, to keep these hard fixed structures,” he said. Instead of permanent buildings, they wondered, what if they had portable ones? Structures that could be collected in a storm, and repositioned in step with the evolving beach? Recently, Ennis gave a tour of some of the inventions he and his team devised. At Tom’s Cove, nearly every beachside amenity can now be taken apart and hauled away in the event of a storm. The showers are powered by a portable solar-panel array. The changing stalls are a Park Service design made of pipe and white canvas panels. And the toilets — Ennis is exceptionally proud of his MacGuyvered toilets, which are prefabricated units that were modified so they can be carried in and out with a forklift. The portable structures were rolled out slowly over the course of a decade, supplementing but not supplanting the permanent buildings. A brutal set of storms in the ’90s hastened some of the changeover. One northeaster in 1998 eroded the shore by nearly the span of a football field in some places. These storms damaged the artificially maintained dunes near the beach at Tom’s Cove, and a decision was made to led the dunes go natural. “What we realized is that in order to keep the island as healthy as possible, we needed to let the natural processes happen,” said Patricia Kicklighter, who served as Assateague’s superintendent from 2009 to 2013. And if the island was going to roll over, then the buildings were just going to have to roll with it. Looking north, showing the northern end of Assateague Island, the Ocean City Inlet, and the southern end of Fenwick Island and Ocean City. 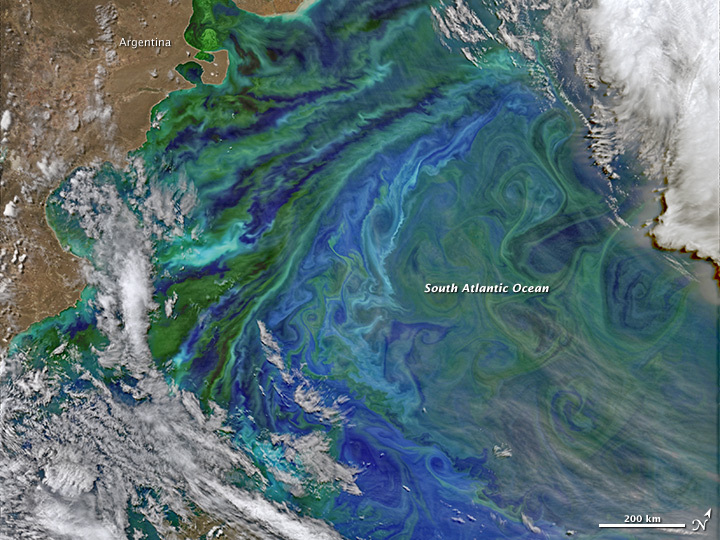 Also visible is the ebb tidal shoal, indicated by the waves breaking offshore. In 2009, the Obama administration ordered agencies overseeing federal land to explicitly account for climate change in their planning processes. When Kicklighter took over Assateague that same year, she made climate change the central issue of the new management plan, which is still in draft form. Assateague was one of the first national parks to conduct this decision making specifically with different climate change scenarios in mind. Recent studies suggest that barrier islands all along the Atlantic are at a threshold. If the sea starts to rise any faster — as even the most conservative models predict — these places may start to rapidly migrate or break apart. 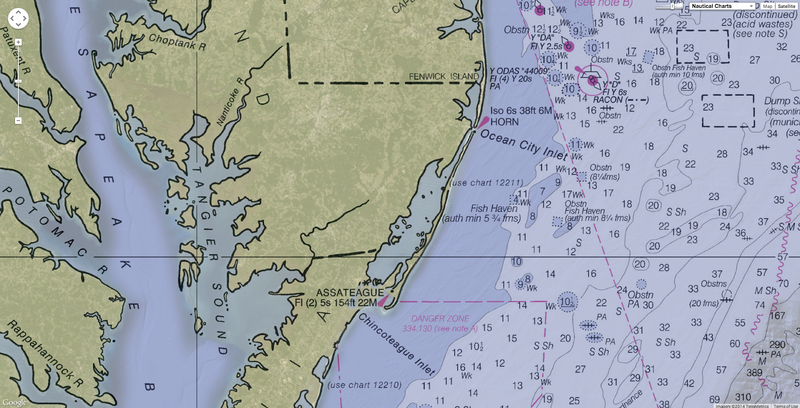 Recognizing Assateague’s fragility, several different courses of action were proposed. The most promising one calls for minimal interference with the island’s rollover or possible fragmentation. There would be ferries to make up for any losses in beachfront parking. If the aging bridge on the island’s north side crumbled in a storm, it wouldn’t be replaced. Parking lots and buildings would move as necessary. And if the waves split the island in two, they would accept that, and work around the new inlet. The proposal, if adopted, would represent more of a shift in attitudes than a completely new way to operate. Much of the work of adaptation had already been done, inadvertently, by Ennis and his team of maintenance workers, as they scrambled to figure out what could survive on Assateague. Rebecca Beavers, a geologist who coordinates the Park Service’s climate change planning in its coastal areas, has high praise for these efforts. “At this point Assateague is one of the best examples of fully considering climate change within their general management plan,” she said. The improvements that Ennis worked on are being rolled into a coastal adaptation handbook that the Park Service is producing. What should parking lots be made of? Should buildings be put on stilts? When is it practical to cling to the shoreline, and when should say, a historic lighthouse be moved to higher land? The results of this research will be of no help to the beachfront communities that have decided to dig in. But the knowledge will still be there when the next storm hits, and the next one; as the cost of rebuilding mounts, and people start to reconsider living where the land has been foreclosed on by the sea. Storms, Ennis said, tend to change people’s minds. When Hurricane Sandy hit the Eastern Seaboard in 2012, it gave a preview of the kinds of storms that seaside towns might soon see with increasing frequency. One of the hardest hit places was Ennis’s hometown of Crisfield, Md. He’d grown up on the outskirts, where his family owned 45 acres of cropland. Ennis’s father worked for the county making roads. His mother made silverware at a factory famous for its crab knives, which has since shut down. Now, the Chesapeake is dirtier, the crabbing no longer so rich. The town has turned to tourism and recreation, touting its marinas and proximity to the Bay. Crisfield’s chief attraction is also its chief weakness. Sandy lay wreck to the low-lying city, flooding the streets to chest height, at one point even floating coffins out of the ground. Residents have vowed to rebuild, many of them returning to their same homes. There’s been talk of a project to bulk up the barrier islands off the coast to protect the mainland from the waves. Similar stories are playing out up and down the coast. On a barrier island in New Jersey, two neighboring towns are erecting a 15-foot-tall steel seawall to protect themselves at a cost of $23.8 million. They are also planning to put in 22-foot-tall protective dunes. In these places, the balance between cost and benefit has not yet tipped in favor of retreat. But more storms are coming. Ennis himself lives with his wife on adjacent Chincoteague Island, which was also flooded during Sandy. He’ll retire in a couple months, and he’s thinking about making his own retreat to higher ground. Maybe somewhere on the mainland. “I would say on the outside I got 30 more years — that’d put me damn near 90,” he said. He pauses for a second. “That’s pretty morbid isn’t it?” he said. Science can now explain what we've known instinctively for millennia: water is good for our bodies, minds and souls. Whether you are an entrepreneur, angler or surfer, cutting-edge research shows that the color, texture, experience, sight and sound of water can make a profound difference throughout your life. Practitioners across diverse disciplines are increasingly connecting the dots between cognitive science and water, explaining why humans put an economic and emotional premium on being near, in, on or under water. I call it Blue Mind: the psychological, neurological, physiological and emotional result of exposure to water. Water's good for our bodies, minds and souls. It's the Blue Mind and it's worth fighting for! The power of Blue Mind is driving both real estate markets and the outdoor recreation industry. It is stimulating our country's most creative entrepreneurs, scientists and problem-solvers, helping to heal veterans and victims of trauma, and affecting numerous other areas of our economy and culture. Let's put Blue Mind in terms of news headlines. I know that three million sea birds will benefit from this protected habitat -- now the largest protected area on Earth. While most of us perceive no direct biological or cultural connection to these atolls, many can still derive rich cognitive and emotional benefits simply by viewing photos of the Pacific Remote Islands Marine National Monument and imagining its marine riches. This momentary escape shifts us into Blue Mind mode and help to inspire exploration, appreciation and perhaps stewardship of our own local waterways. Indeed, Philippe Cousteau, co-founder of the nonprofit Earth Echo International, said of the designation: "Conservation actions such as these send an incredibly powerful message to today's youth, as they foster a curiosity and broaden the scope of what's possible for our next generation of conservationists, scientists, and educators." But these benefits of water - environmental, psychological and spiritual -- are available only if we take the necessary steps to protect our clean water and ensure it remains available and accessible to all of us. At some point, no matter how vivid our imagination, the science shows that humans still need to touch water in order to enjoy its benefits: walking the beach, casting a line into a lake or river, swimming in a pool. This psychological need for physical contact with water is a very real component of our well-being and should be factored heavily into any water-related decisions enacted by policy makers. 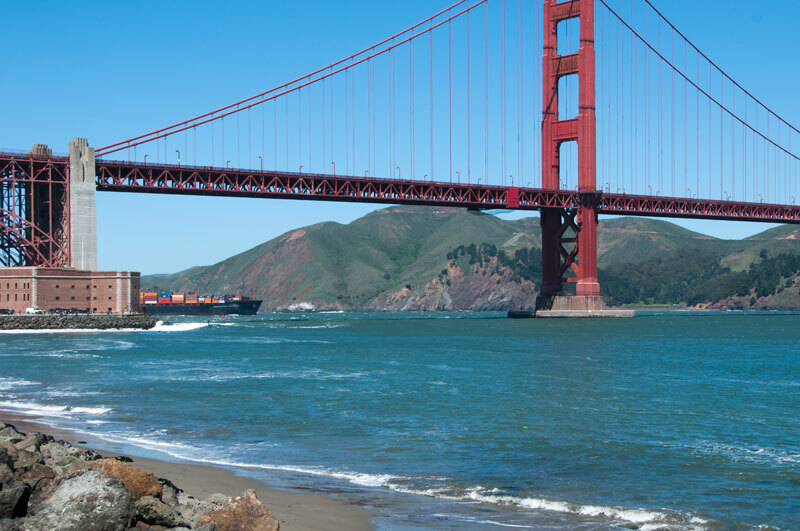 Right now, development is increasingly walling off public access to beaches, waterways and prized fishing spots on public lands nationwide--something we read constantly about in the news here in California. In the name of economic progress, humans are being deprived of access to clean water vital to our health, our creativity, our sanity, our Blue Minds. Currently, policy makers in Washington are considering a draft Environmental Protection Agency rule to re-extend the Clean Water Act's protections (weakened by confusing Supreme Court rulings) to include the headwaters of streams and wetlands. Without this protection, industry is able to pollute these areas, which feed into the sources of drinking water for 1 in 3 Americans. Industrial pollution caused a river in Ohio to burn 42 years ago - motivating Congress to pass the Clean Water Act. The proposed clean water rule comes none too soon: drinking water bans due to pollution in Ohio and West Virginia this summer are a reminder that we have more to do to protect our waters at home. By preserving our planet's oceans and waterways, we also enhance and restore the vast, under-appreciated cognitive, emotional, psychological and social benefits they provide. There is an interdependence with the natural world that goes beyond ecosystems, biodiversity or economic benefits. It's a basic of life. Water nurtures us and so we must nurture water.